Beer Nerd Details: 8.1% ABV bottled (750 ml caged and corked). Drank out of a goblet on 8/26/11. * And in such cases, their beer is still among the best out there. ** Rice is typically an adjunct used by the big macro breweries to lessen costs. Sugars derived from rice are very simple and thus completely consumed by yeast, increasing alcohol but not really impacting the taste. This proves useful for light, flavorless beers, I guess, but in the case of The Bruery, they're adding it to an 8.1% ABV beer of a style that is usually overflowing with taste. In other words, The Bruery is using rice to enhance and complement the beer, rather than to make the beer cheaper and more flavorless. 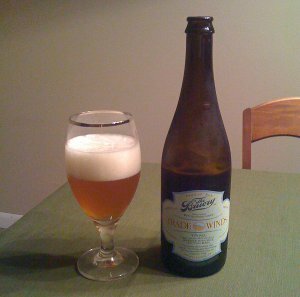 *** Indeed, it almost reminds me more of a dry saison than a tripel. Sorta like a summer tripel - and this being a summer release that features the words "Summer Fun" on the label, I guess that makes sense. This page contains a single entry by Mark published on September 4, 2011 12:32 PM. Anchor Liberty Ale was the previous entry in this blog. Weyerbacher Heresy is the next entry in this blog.